On October 23rd 1956, there was a big revolution in Hungary, with fights taking place in the streets of Budapest (but not only). You can read about it on Wikipedia or maybe here. The memory of it is a part of us and Budapest. I think every Hungarian has at least one relative who fought in 1956 or suffered from its consequences. 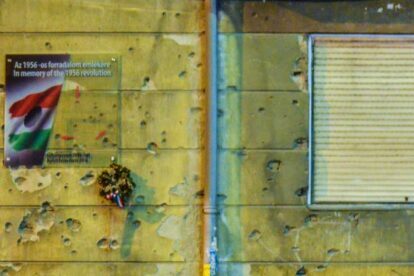 In the not-so-fancy parts of Budapest, we can still find bullet holes. Real holes. They are not just a monument, they are a real sign of use of weapons. In District 8, we can find the real memories living with us. Some of them are certified, like this spot on the corner of Vajdahunyad and Nap street.